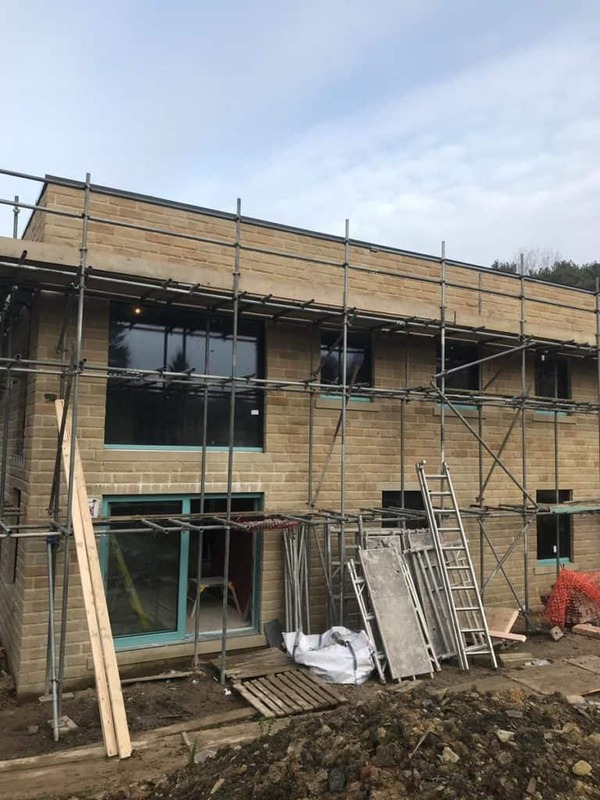 The PROGRESSION windows and ULTRA doors for the Kirkburton Passivhaus project have recently arrived on site and are in the process of being installed. The PROGRESSION range is Passivhaus certified and A rated and has very narrow sightlines, so appears virtually frameless. The ULTRA timber doors match the PROGRESSION range well and have the advantage of helping to keep costs down on the project. Our strategy for installation and detailing of windows within the wall is different to our strategies at our previous cavity wall Passivhaus projects at Denby Dale and Golcar. 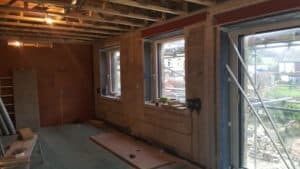 At those projects we located the windows in the centre of the cavity, using plywood boxes for structural support and airtightness and bespoke aluminium cavity closers to cover the external gap in the cavity. Locating the windows in the middle of the cavity minimised the thermal bridges and so improved the psi values at these junctions. PROGRESSION is a PHI ‘A rated’ certified Passivhaus window. Its improved performance and ‘frameless’ design gives us a little more room to manoeuvre in PHPP, while ensuring we can certify the project. The PHPP modelling showed that, even with this detail, we could still achieve Passivhaus certification without needing to up the insulation specification from the most cost-effective mineral cavity wall insulation (with a lambda value of 0.037 W/mK), helping with our efforts to ‘value engineer’ the project. This new detail makes it much easier to install, so we’re able to reduce installation time, without the need for supply and installation of aluminium cavity closers. We can reduce costs, both by cutting out the material costs of supply of the external cavity closers, and, of course, saving on the costs of installation. This ties in with our our aims to ‘value engineer’ this project as far as possible. 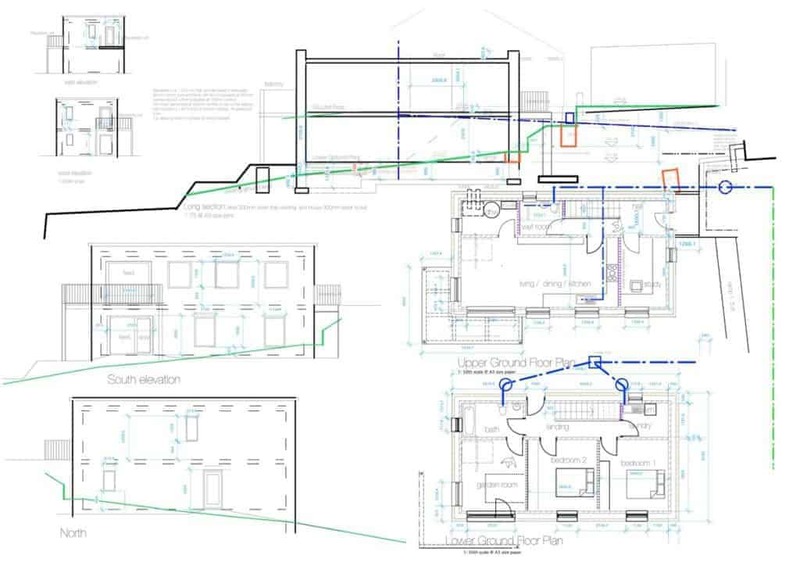 Having already built the two other cavity wall projects, we’re feeling more confident this time and trusting that the team will achieve good airtightness results and feeling that we can get away with a controlled level of thermal bridging in the build, when carefully modelled in PHPP. 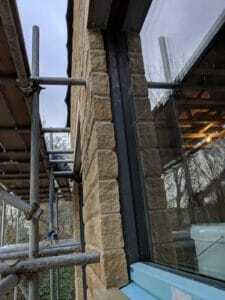 As a by-product of this decision we also have the aesthetic benefit of being able to use traditional stone cills for this project, which are looking very good. Another result of this approach is that the windows will have very deep internal reveals. As we’re positioning the windows out further towards the outer face of the building and because the windows are quite large, we’ve used Compacfoam 200 rigid thermoplastic insulation for extra support. 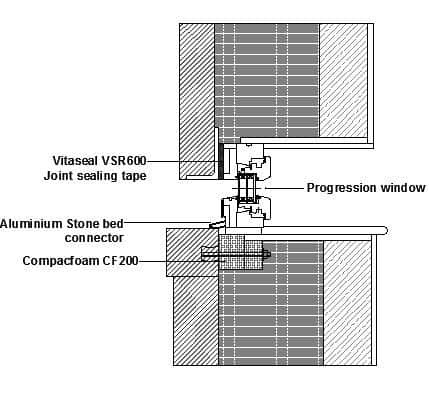 The Compacfoam 200 is bolted to the back of the stone cills to helps reduce thermal bridging at this junction. PHPP modelling is suggesting that there may be an overheating problems at the project from high summer sun on the south facing elevation. Shading here is quite complex due to there being many trees adjacent to the site. The guidance on shading from our certifiers has changed during the course of the development of the project, and consequently PHPP is now showing more likely overheating than when we started the project. So, we will need a good shading strategy to prevent potential overheating at the project. The balcony, wrapping around the south-west corner on the first floor, offers good shade for the downstairs garden room lift and slide patio doors. The large living room fixed pane window will have an external roller shutter mesh blind, operated electronically. Following discussions with our clients, we have deferred the installation of internal inset blinds on the remaining 3 first floor windows until after our clients have experienced living in the house. These will not be as effective as external blinds, but they are a lot cheaper, so will be a sensible approach for these windows should our clients start to experience any overheating problems. In the next blog we’ll be looking at our MVHR and heating strategy for the project. An interesting approach. You’ve carefully shown the head detail with Vitaseal tape sealing the window/outer leaf gap. 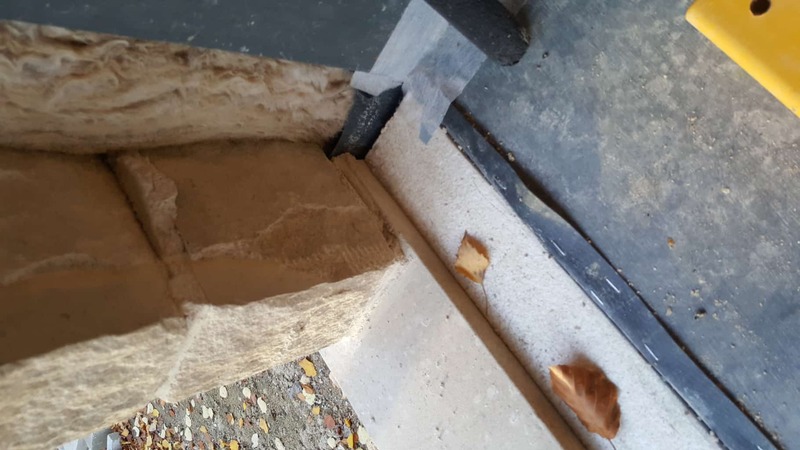 This works fine where you’ve got a nice smooth lintel but what have you done on the jambs where you’re up against rough stonework? I can’t believe the tape is accommodating enough to take up all the surface imperfections. The other problem you’ve overcome is supporting the window at the sill. I quite like the use of Compacfoam which I feel could be adapted for a sill detail without a stone sill i.e. just brick – but aren’t you missing a dpc? 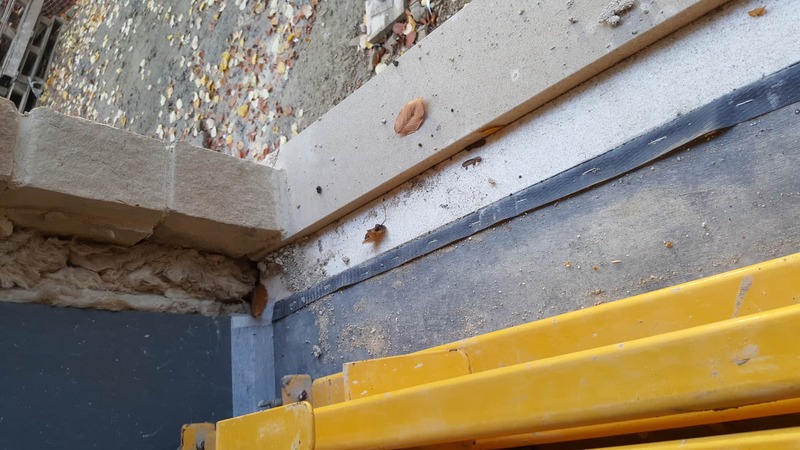 The stone used in the outer leaf is worked with a relatively flat back face and the Vitaseal has a very good ability to fill any uneven gaps as long as the mortar bed is done carefully. Care also needed in using correct spec of tape for expansion and subsequent weather tightness. Brickwork would be easier still. We have installed a dpc under the cill. We hadn’t included on sectional drawing for simplicity. Specialist Passivhaus window and door range with minimalist contemporary design, at a competitive price.